M4V converter: How to convert M4V to AVI on Mac? As we know, Apple uses the M4V files to encode TV episodes, movies, and music videos in the iTunes Store. Some people may want to convert M4V files to other video formats like AVI. Xilisoft Video Converter for Mac is a powerful Mac video converter program to convert M4V file to AVI and other popular video file formats. What's more, it has many interesting video editing functions: clip, crop, merge, split, watermark, and add soundtrack, which will enhance your conversion enjoyment. 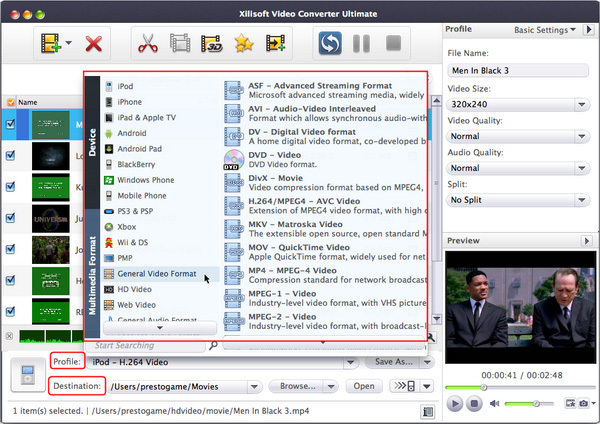 This article will show you how to use Xilisoft Video Converter to convert M4V to AVI easily. Step 1: Download Xilisoft Video Converter for Mac, install and run it. If you are Windows user, please download the Windows version. Step 2: Load M4V files. Click "Add File(s)" button to load your M4V files. Step 3: Set output format and output folder. Choose M4V files you want to convert, and click "Profile" drop-down button to choose output file format. You can choose "AVI - Audio-Video Interleaved (*.avi)", "DivX Movie (*.avi)" or "XviD Movie (*.avi)". See AVI? DivX? XviD? What's the difference? Click "Browse" button to choose destination folder for saving your converted AVI video files. After choosing the format, you only need to click "Convert" button on the toolbar to complete the M4V to AVI conversion task. If you're interested in this M4V converter program, please visit to free download and have a trial: Xilisoft Video Converter for Mac.